In the heritage-listed Metcalfe Bond Store on Sydney harbour a young technology company is conceived as a series of installations that include a gymnasium and view access for all. 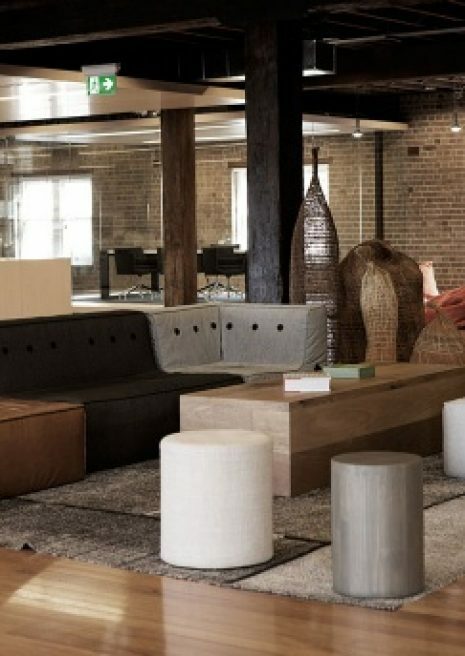 Ben Mitchell talks us through this Gen-Y workplace. Our client, Ansarada, provides virtual data rooms for large-scale business transactions worldwide. The company was named Deloitte’s 2009 Technology Fast 50 winner, Smart Company’s 2010 most innovative company and in 2011 handled London’s largest ever IPO, the $59.2 billion Glencore offer. 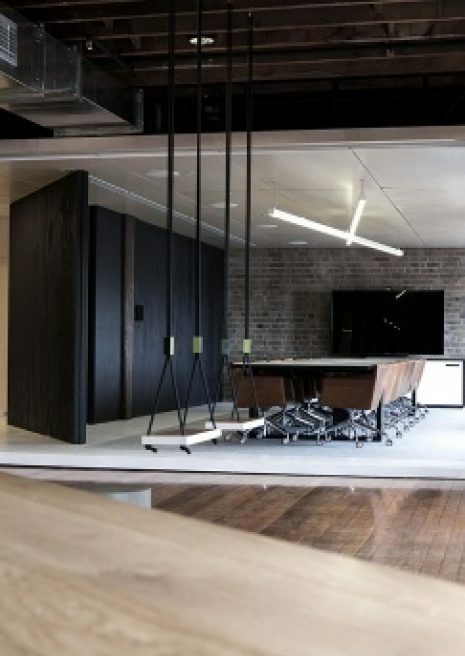 Ansarada has offices around the globe and works with some of the world’s leading financial services firms and investment banks, but its roots remain firmly in Sydney, so this new space is a global office. Built between 1912–1916, the Metcalfe Bond Store building in Sydney’s George Street Rocks District is listed on the New South Wales Heritage Register. This is very restrictive in terms of design because you can’t mechanically fix into, and/or alter any of the existing fabric. For a rapidly growing, young technology company, that presents a major issue. 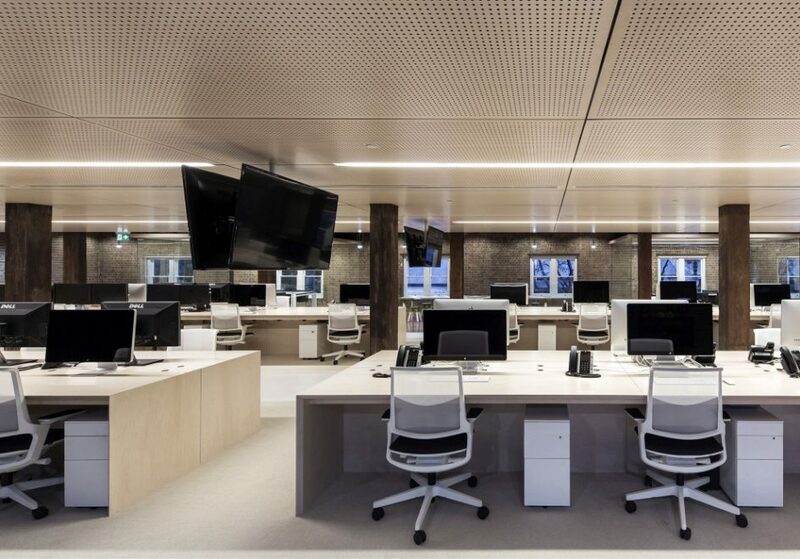 The biggest challenge for us was to figure out how to accommodate the technological brief in a way that retains the integrity of the 850 square-metre space. It sounds simple, but it was complex to resolve and still present a clean, legible contemporary installation within the existing heritage fabric – which we were adamant should also be expressed. Ansarada does not own this building and, like many expanding companies, intends to inhabit the space as a medium-term solution. Furthermore, the company’s technology platforms are hosted in ‘the Cloud’, so they can operate anywhere in the world and require no fixed geographical location. We took our cue from this and conceived the fitout as the architectural equivalent of ‘the Cloud’, in that everything is designed to float, to temporarily occupy and to be relocated with minimum fuss. In terms of workplace design, I think a fitout should do three things: it should work from an architectural point of view, it should embody the client’s brand values and core beliefs, and it should shape the way people interact with each other. Working in the technology field is demanding. It requires spending a lot of time at work – often around the clock in meetings, video conferences and development. It can make for major ongoing stress, and accordingly, Ansarada makes a priority of taking care of its staff. This extends to having a personal trainer on site daily, to design individual well-being programs with each employee. We needed to design the fitout so it catered to recreational moments, personal fitness and loads of personal interaction as well as long hours of work. So, rather than functioning solely as a workplace, this fit-out must serve a multiplicity of purposes. It includes informal meeting rooms, a boardroom, a video conferencing facility, informal meeting and entertaining spaces, desks for more than fifty staff, a gym, informal eating and reception areas. It should work from an architectural point of view, it should embody the client’s brand values and core beliefs, and it should shape the way people interact with each other. We call this the ‘Jack in the box’ approach – Nothing is quite as it appears. In keeping with their brand values, everything had to be transparent, open and flexible, and (to comply with heritage regulations) non-invasive to the building. This is an exceptionally long, large space. Rather than simply dissect it into smaller boxes, like a traditional office, we zoned the floor plate to make it relevant to the scale of the human body. By avoiding a traditional compartmentalisation of space, each zone maintains a dialogue with the others as well as with the original heritage building. Junctions between our architectural interventions and existing building fabric are clearly defined so they sit within the heritage envelope in a legible way. For example, everywhere we’ve exposed the existing floor, we’ve also exposed the existing herringbone ceiling above. This makes it clear where we have made interventions and defines the architectural parti. Like a lot of Gen-Y businesses Ansarada is hierarchy neutral, so there was scope for an equitable distribution of the spectacular Harbour Bridge-to-Opera House views. We centrally located the main workspace of four, nine-metre-long undivided workstations through the middle, accommodating everyone from the CEO to the admin assistant alongside one another. We activated the harbour side with an arrangement of custom-designed modular furniture, a swing set and gymnasium, all of which affords everyone unimpeded visual access to the views. We conceived this as the ‘democratic edge’ and it has been successful in increasing staff morale, as proven in a recent survey the company commissioned. Given all these imperatives everything had to work twice as hard and be twice as clever, and every element had to perform a second or even a third function. We call this the ‘Jack in the box’ approach – everything is not quite as it appears. For example, what appears to be a beautiful maple-faced wall is in fact a massive overhead tilting door on hydraulic struts that conceals a fully functioning kitchen catering for the fifty-plus employees. 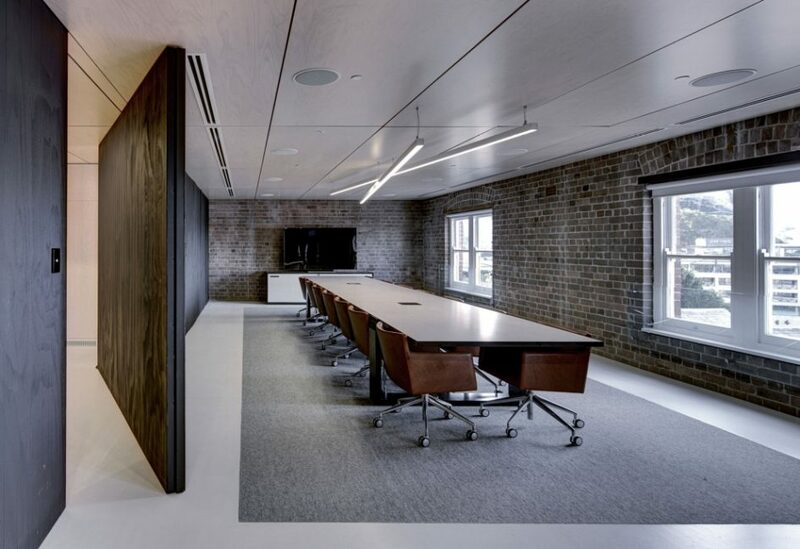 The textured black timber panel wall flanking the boardroom doubles as the entry door – pivoting on its axis when pushed at just the right point. 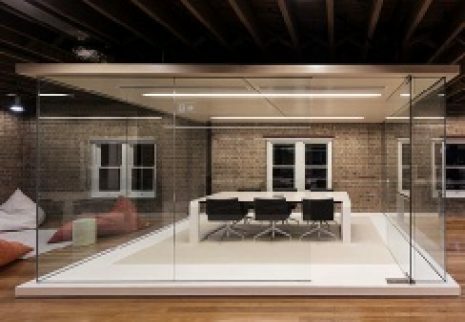 Flat screens are concealed in the ceiling panels of the glass-walled rooms allowing them to be equally useful for technical meetings or informal discussions. The screens operate on a remote control lift system and can be lowered from the ceiling at the touch of a button. 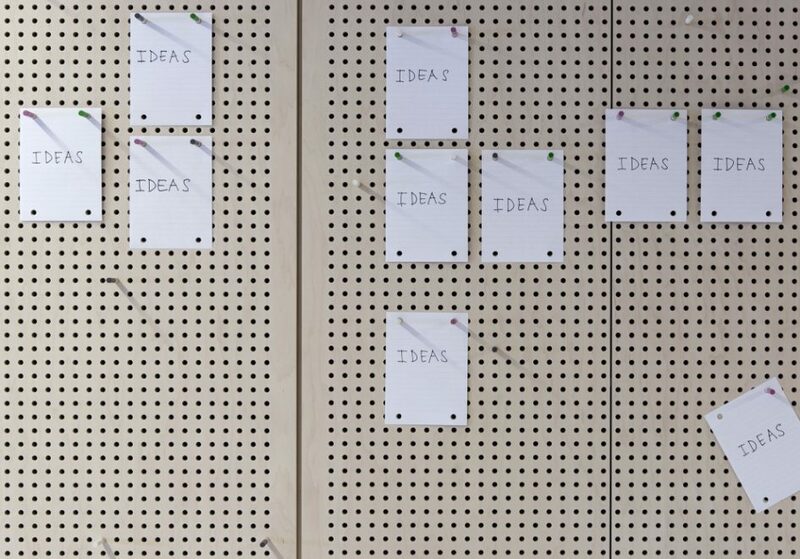 Adjacent to the main workstation space, a plywood-panelled wall conceals file storage and doubles as a playful pegboard while also performing as an acoustic attenuation device. A major concern in the mixed-program open-plan space was acoustics. Ansarada is a highly interactive business, with lots of discussion and verbal development of ideas, so from day one we were thinking about how we could address this in an elegant way. 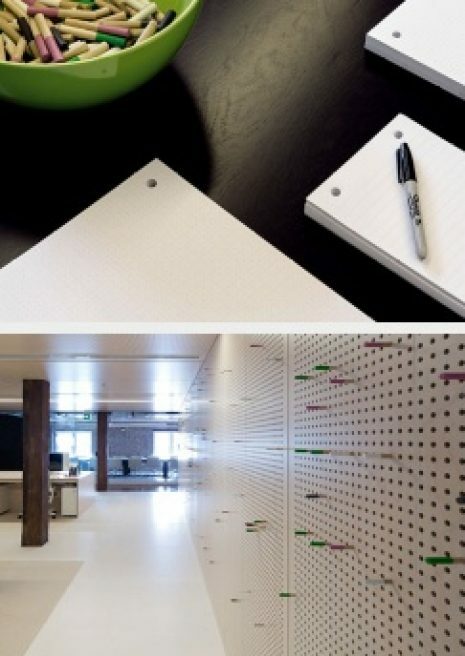 One of our developments was the pegboard wall system that utilizes the perforations in acoustic plywood for staff to pin their ideas up on coloured dowels. The perforations also provide an acoustic barrier between the main workstation zone and the quiet rooms beyond. The clients use this system consistently to workshop and develop new products. As the company is rapidly expanding, workstations are designed to ‘grow’ as staff numbers increase. Surfaces have been given material complexity to soften the ‘commercial’ feeling of the space integrating soft woven fabrics, rich full grain leathers and bespoke carpets. These work well paired with the hard surfaces of the existing timber and masonry interior. We call the result ‘luxe minimalism’, which not only pairs with Ansarada’s personality and brand values of sophistication, simplicity and authenticity, but also with our own design philosophies. Ansarada Office won the Workplace Design Award at the 2014 Australian Interior Design Awards, the Interior Architecture Award at the 2014 New South Wales Architecture Awards, the Commercial Interior Fitout Award at the 2014 Timber Design Awards and a Spacial Design Award at the 2014 Australian Design Biennale.